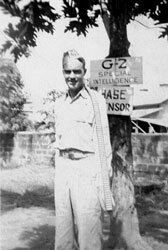 1LT George S. Tommy Thompson. New Guinea, 1944. George Thompson. Fergusson Island, N.G. Dec 1943. 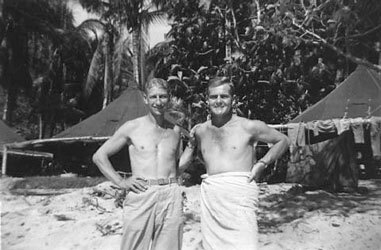 Lew Hochstrasser and George Thompson, Fergusson Island, N.G. 1944. 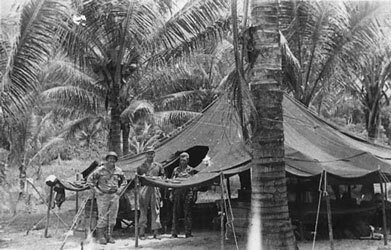 Alamo Scouts following a mission in Northern Luzon. 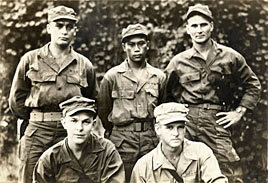 May 1945 L-R: Filipino Radio Operator, Glenn Heryford, George Thompson and Leonard Scott. NELLIST TEAM. Back row L-R: Galen Kittleson, Thomas A. Siason, Andy Smith. Front row: Wilbert Wismer, Bill Nellist. 1944. McGOWEN TEAM receives the Silver Star from LTG Walter Krueger following their successful mission on Los Negros Island. 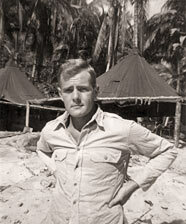 New Guinea, March 1944. 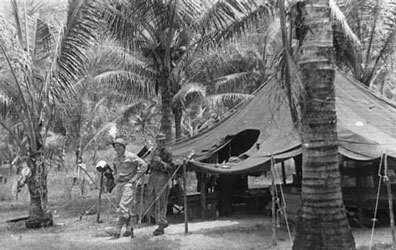 L-R: Lieutenants Fred Sukup, George Thompson, and William Barnes at the ASTC, Fergusson Island, N.G. 1944. Fred Sukup and George Thompson. Fergusson Island, N.G. 1944. 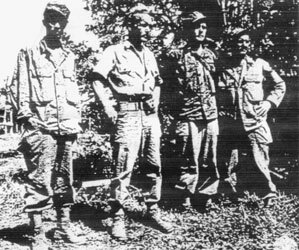 NELLIST TEAM after Cabanatuan POW camp liberation. Back	row L-R: Gil Cox, Wilbert Wismer, Andy Smith. Front: Galen Kittleson, William Nellist. 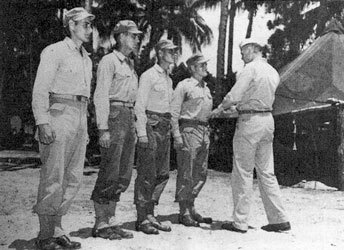 COL Horton V. White, G-2, Sixth Army, presents members of	DOVE TEAM with a medal following the Hollandia mission. 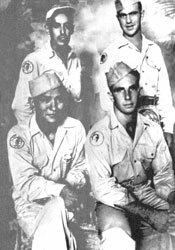 L-R: Irvin B. Ray, Vern R. Miller, John G. Fisher, John M. Dove. Mayo Stuntz outside Sixth Army Special Intelligence. Luzon, 1945. 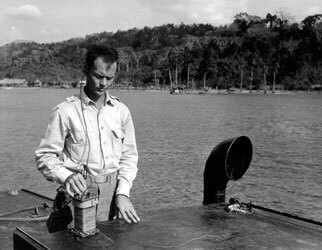 Alamo Scouts instructor Milton Beckworth operates an underwater radio transreceiver. Luzon, 1945. 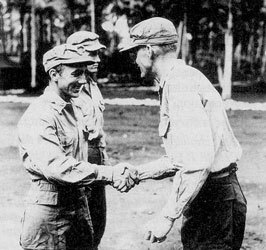 Louis Belson is congratulated by Red Williams after receiving the Silver Star. 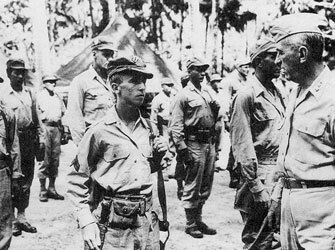 Also receiving the Silver Star is Aubrey L. Hall to Belson's left. Finschaven, N.G. 22 June 1944. LTG Walter Krueger inspects trainees, (CPL Robert Beattie in forground) at the Alamo Scouts Training Center at Hollandia, D.N.G. Aug 1944. 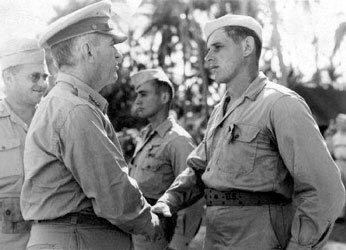 LTG Walter Krueger congratulates Gilbert Cox after awarding him the Silver Star and Bronze Star for separate actions. Galen Kittleson standing in background. 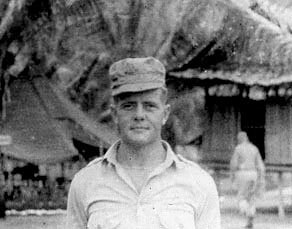 Leyte, P.I., 1944. 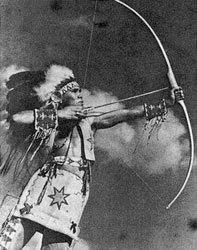 Alamo Scout Zeke McConnell in traditional Native American dress before the war. 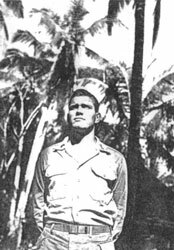 1LT John M. Dove. New Guinea, 1944. 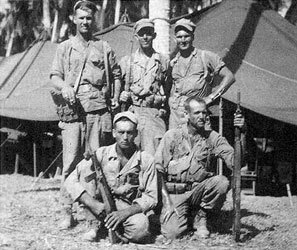 Americans and Filipinos who fought with the Filipino guerrillas. 1944. 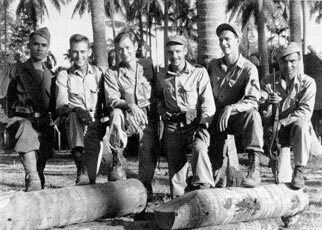 Left to right: Lt. Hombre Bueno, Lt. William Farrell, Maj. Robert Lapham, Lt. James O. Johnson, Lt. Henry Baker, and Lt. Gofronio Copcion. Johnson and Farrell were graduates of the third Alamo Scouts Training Class. Baker graduated from the seventh training class and was retained as an instructor. 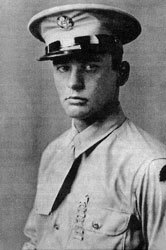 Galen Kittleson prior to joining the Alamo Scouts. Alamo Scouts at the end of the war. Luzon, 1945. Back row L-R: Paul Adams, Arnold Bethell. Front row: Cruz Vega, Ken Cameron.